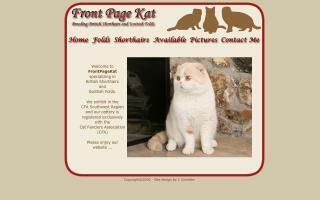 Scottish Fold Cat Breeders Directory - O Kitty! 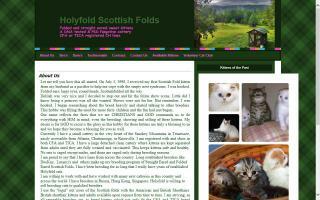 Pictures of show quality Scottish Fold cats and kittens. 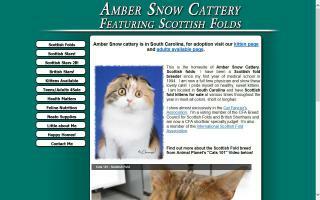 Amber Snow Cattery Scottish Fold kittens sometimes available for sale or adoption. British Shorthair kittens also! You've found the site where you can have the confidence to fall in love with a quality British Shorthair or Scottish Fold kitten! We have been breeding British Shorthair and Scottish Fold in Montreal since 2004, and we specialize in finding loving homes for our kittens across Canada and the US. We only breed shorthair cats, which guarantees purebred. Health, quality, and temperament are our watchwords, and you can be sure that superior bloodlines are blended here, including Canadian Champions as well. 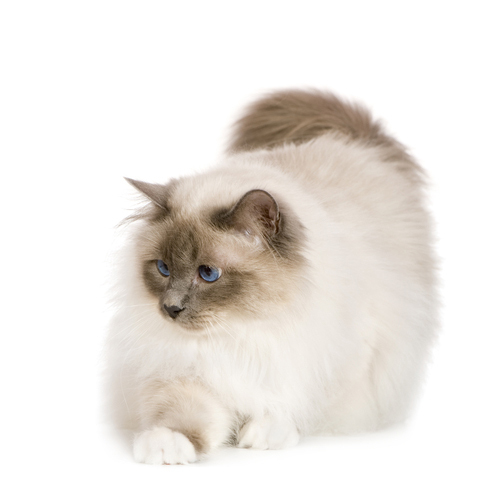 Our cattery offers a variety of colours: classic blue, cream, black-satin, tuxedo, bi-colour, and silver tabby. All our stud cats are thoroughly chosen to have a match that gives the best possible quality of our litters. We are a member of Canadian Cat Association, and all our kittens are sold registered at CCA. Please come and meet my boys, girls and babies. 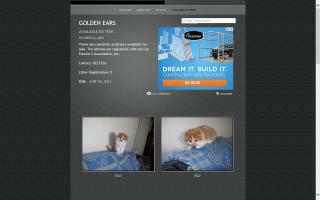 Visit our web site dedicated to our Scottish Fold and British Shorthair cats. 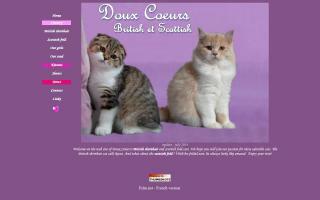 We are situated in France, Europe, and have been breeding Scottish Folds for many years. Have a look at our bears! 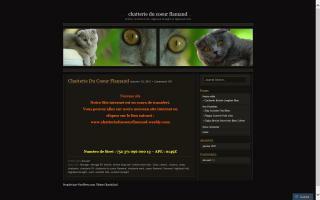 We are a small cattery in the north of France. We breed only a single litter a year. All our cats live with us. Our passion began in our childhood, having been raised with animals of all kinds, including cats and dogs. Having always wanted a Scottish Fold and a British, we put ourselves in search of a Scottish Fold. Since 2009, we decided to breed Scottish Folds, Highland Folds, British Short Hairs, and British Longhairs in the colors blue, lilac, blue creme, creme, chocolate, and cinnamon. 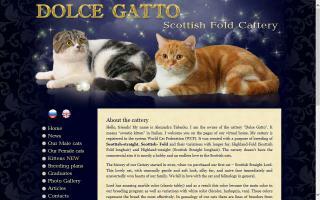 Italian Scottish Fold cattery. WCF-AFI Association cattery. Please do not hesitate to contact us by phone or e-mail for further information. We will answer your questions with pleasure. Hello, my name is Alexandra. I am a breeder. I follow the professional guidelines during the breeding of my Scottish cats. It is based on the contemporary genetic and veterinary knowledge. 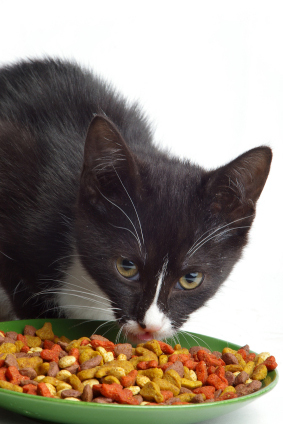 All my cats and kittens are completely healthy, regularly screened by a veterinary doctor. Also, all my kittens move into their new homes fully vaccinated, including vaccination against rabies. They have a microchip, an international veterinary certificate, and a passport. I also help with the delivery of my kittens around the world. Many graduates of my cattery live in different countries: Russia, USA, France, Belgium, Poland, Thailand, Hungary, and others. 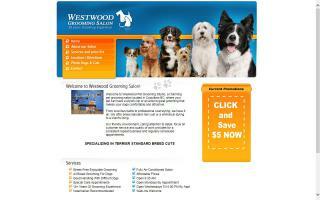 We are a small CFA cattery in the foothills of the Blue Ridge Mountains of central Virginia. My goal is to breed Sottish Folds for quality in health, temperament, and type, never quantity. All kittens are raised underfoot, loved, and spoiled. 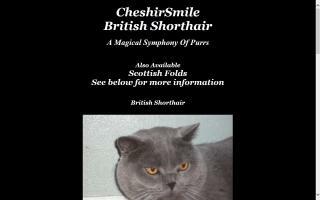 Specializing in Scottish Folds and British Shorthairs. My name is Marina. I am a rightful owner of the cattery "Goldmine". 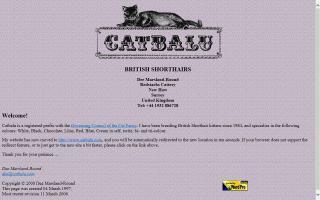 We are breeding: Scottish Fold, Scottish Straight, Highland Fold & Highland Straight сats. 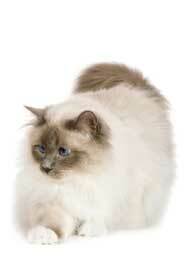 - blue eyed silver & golden shaded colour-point cats. 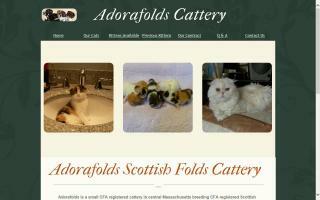 Professional breeder of Scottish Fold cats. The Scottish Fold cats or kittens are unique and adorable cats and make a great gift. Kittens from Katareece Cattery.